THE RUB’ AL-KHALI (Arabic for “Empty Quarter”) is located in the southern part of the Arabian Desert. The Al-Murrah Bedouin, who roam its southern edges call it the ar-Ramlah, the “sand.” It covers an area of about 250,000 square mi (647,500 square km). It is somewhat smaller than TEXAS or about as large as FRANCE together with BELGIUM and Holland. 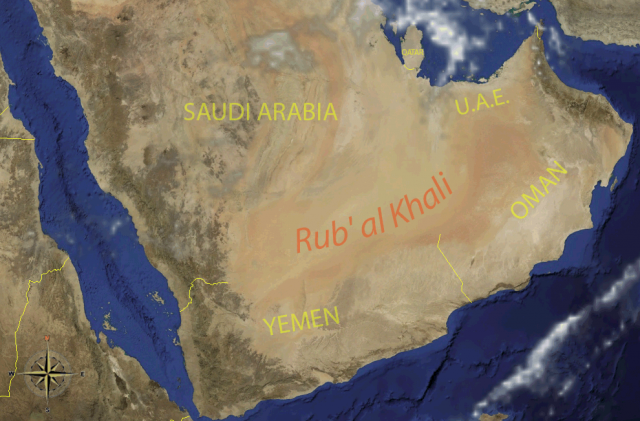 Most of the Rub’ al-Khali is in southern and southeastern SAUDI ARABIA. It covers about a fourth of that country. It is about 700 mi (1,127 km) long east to west and about 400 mi (644 km) wide north to south. The northern boundary of the Rub’ al-Khali is the central plateau (Nedj) of Saudi Arabia. While most of it is in Saudi Arabia, the southern boundary overlaps the borders of YEMEN and OMAN. In the east, the Rub’ al-Khali overlaps the boundaries of the UNITED ARAB EMIRATES. The Rub’ al-Khali slopes from an altitude of about 3,300 ft (1,006 m) in the west to close to sea level in the east. The Rub’ al-Khali is connected to the Nafud sand desert in northern Saudi Arabia by the Dahna belt of sand dunes. A northwesterly wind, called the shamal, shapes the dunes making them into an active sea of shifting sand. The shamal grows in force each day with the heating of the air. It also causes sandtorms in the eastern part of Saudi Arabia. During the February to March monsoon season, the wind blows mainly from the south. The wind forms the sand dunes into many shapes. Aerial and space photography have shown that the dunes are arranged in belts, but take many shapes. In the western area of the Rub’ al-Khali are many linear dunes that run for many miles in a northeast-southwest direction. In the north-central area of the Rub’ al-Khali is the great Wabar impact crater created by a large meteorite. A number of meteors have been found in the vast sand dunes. The dunes in this area are also often crescent-shaped. Some of the crescent dunes have fishhook shapes at their end or are like scimitars. Some dunes are red sand. The eastern part of the Rub’ al-Khali fills a broad, shallow basin that slopes toward the southern shores of the PERSIAN GULF. The eastern area is relatively level but covered with salt flats (sabkhas) in many areas. The sabkhas can be quagmires. In the south, the water from the wadis flowing off the coastal plateau that borders the entire southern end of the Arabian peninsula disappears in the sands of the Rub’ al-Khali. In Oman, this drainage creates a very dangerous region of quicksands and poisonous bogs called the Umm al Samim. Most of the Rub’ al-Khali is uninhabited and much of it is some of the driest land on Earth. Temperatures in the Rub’ al-Khali can reach 130 degrees F (50 degrees C) or higher. The humidity is usually quite low. Very little fauna and flora are found in the Empty Quarter. The rains that do fall are either in the northern area from winter rains or from monsoon rains off the ARABIAN SEA. These rains can stimulate the growth of vegetation lasting up to three years. The Rub’ al-Khali was much wetter in prehistoric times. Bones of animals and flint arrowheads have been found in a number of locations. Many desert plants do grow when the rare rains come. There are also numerous insects, snakes, and other animals. In 1992, the “Atlantis of the Rub’ al Khali” was uncovered from a layer of sand. The ancient fort is believed to be the legendary lost city of Ubar. American archaeologists located the ruins with radar images taken by the ill-fated space shuttle Challenger. Ubar was famous in ancient times as a city of great wealth that produced frankincense. The east area has many oil and gas fields. The al-Ghawar oil field (discovered in 1948) is one of the largest in the world. The Al-Murrah, the Rashidi, and other Bedouins have wandered the eastern region, but the advent of oil has forced the settlement of most of the Bedouin.